There are many different types of Picture Puzzles. Good thing about Picture Puzzles is that these puzzles does not require Mathematical Skills, Logical Reasoning or English Language Knowledge. If one's observation power is good, he/she can easily solve these picture puzzles. Finding the Odd One Out is one of the picture puzzle which will given challenge to your mind. Here is the Odd One Out Picture in which puzzle image from Solitaire Game is used. 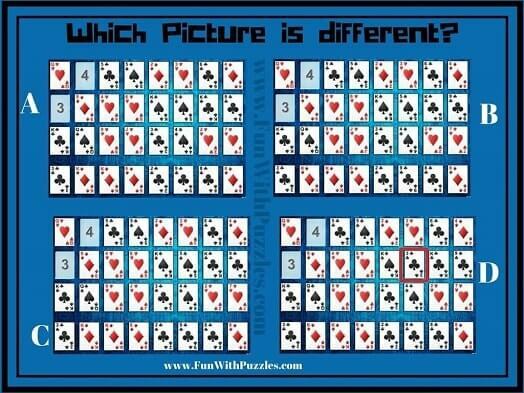 In this Solitaire Picture Puzzle, there are four images of Solitaire Game. 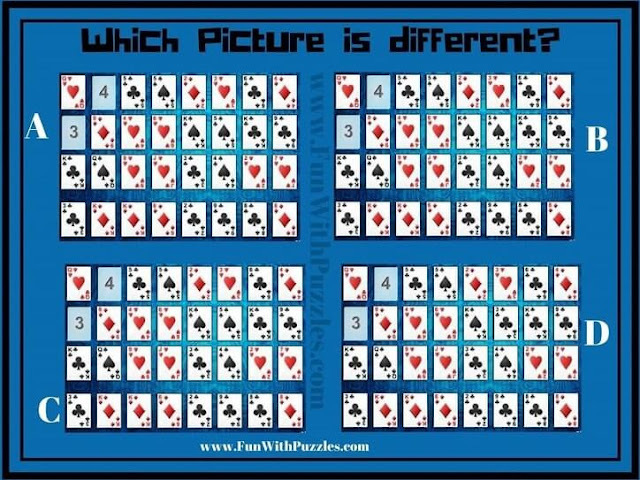 Three picture puzzle images out of these four pictures are exactly same. 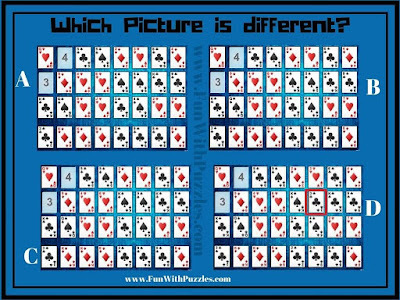 However there is one puzzle image which is different from other three puzzle images. You have to use your Observational Skills to find out this Odd One Out Picture. 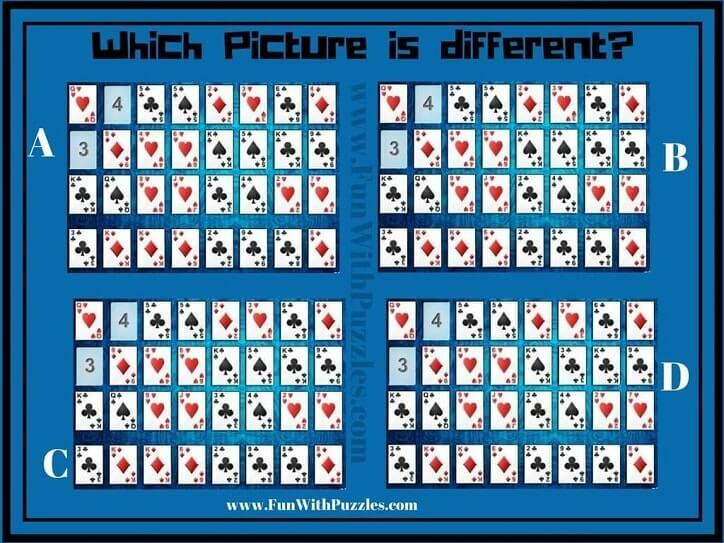 Can you find which Picture Image is Different? 1. Mathematics Logic Brain Cracking Problems: If you like to solve Mathematical and Logical Puzzles, do check these brain cracking problems to challenge your mind. 2. Fun Brain Teasers For Kids, Teens and Adults: These are the most liked Brain Teasers on this website. It contains mix of Mathematical, Logical and English Word Brain Teasers. 3. 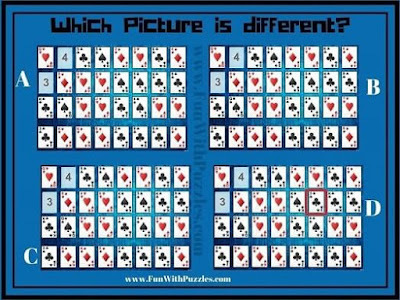 Tricky and cool brain teasers of finding mistakes in given pictures: These the tricky and cool brain teasers in which has to find the mistake in the given puzzle picture images. 4. Finding Hidden Faces Brain Teasers: These are the Picture Brain Teasers in which one has to find the hidden faces of human and animals in the given picture puzzle images.